As I wrote on my professional blog when reviewing his YA novel Fog a Dox on my LisaHillSchoolStuff blog, Bruce Pascoe, of Bunerong-Tasmanian heritage, is an award-winning indigenous author, editor and compiler of anthologies. In addition to writing a number of novels and non-fiction books for adults, he has also published a Wathaurong dictionary to support the retrieval and teaching of the Wathaurong language in south-western Victoria. Fog a Dox won the YA category in the 2013 Prime Minister’s Literary Awards and last year I reviewed Pascoe’s remarkable story of indigenous agricultural practice, Dark Emu which IMO is destined to become an essential reference book for anyone wanting to know about how this country was farmed prior to European settlement. 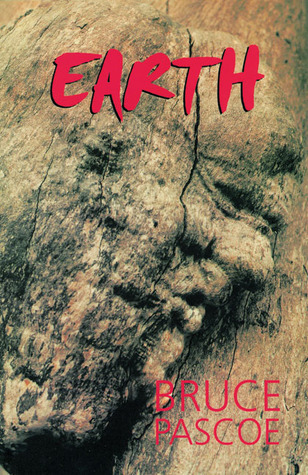 Earth (2001) is the fifth of Pascoe’s novels, which include Fox (1988); Shark (1999); Ruby-eyed Coucal (1996); Ribcage (1999) Ocean, (2002); Bloke (2009) and Fog a Dox (2012). On the strength of this one, I’m now on the lookout for the others, some of which are still in print at Magabala Books. Written entirely in dialogue from which the reader derives the characterisation, setting and plot, Earth tells a story from the Werribee district west of Melbourne in colonial 19th century Victoria. (Allusion to the first Royal Visit to Australia by Prince Albert dates the ending as 1867). Characters based on real life people include William Angliss and Sir Redmond Barry who have a conversation suggesting that bribing the Governor could be a way of countering the proposal to ‘allow the true titleholders free access to their tribal land’. The strategy might also be supplemented by reviving talk about black insurrectionists (i.e. freedom fighters) and perhaps there could also be some interference in the investigation of the untimely deaths of the sheep killers on the Werribee’. (p. 72) These characters needn’t have worried because the trial was a circus. There was blatant flouting of the rules of evidence and flagrant dismissal of the prosecutor’s attempt to get justice for the three Aborigines who’d been summarily massacred by Officer McCallum for the theft of one sheep, Moorabool, Parnum and Mariwun. One of the witnesses, Frank Palmer, is ambivalent about his Aboriginality and represents the struggle for identity that characterised the invidious position of indigenous people in this period. Although he ‘passes for White’, he is descended from King Billy, (a character who may have been be modelled on King Billy of Ballarat, a Wathaurong man who is briefly mentioned in a book called Black Gold: Aboriginal People on the Goldfields of Victoria, 1850-1870 by Fred Cahir.) But Frank is initially very anxious when his grandson Alf tells him what he’s been told about his indigenous relations, because he fears the discrimination that will result. Married to Claudie, a white woman with whom he has a loving and respectful relationship, Frank eventually has to confront his self-suppressed heritage when young Betty, raped by the local lout Eric Pearson, has her son taken away. With Claudie’s reluctant support he takes on a quiet battle for custody of the baby. There is a glossary of the Wathaurong language, from the Ballarat, Geelong and Airey’s Inlet region, at the back of the book, but I found that most of the time I could guess the meaning, as in this excerpt you can guess that kurraiyn means salt. (There are still large salt pans in the Geelong area at Moolap, and of course the salt was traded prior to European settlement). Sit still and listen, because in a few bloody sunrises I’m gettin’ back to fixin’ up your bloody excrement and plastic bags. Who invented the plastic bag? One of them men, I bet. This isn’t the only example of Bruce Pascoe’s playful sense of humour, and Frank and Claudie’s love story is beautiful. Since this is written entirely in dialogue how easy is it to follow who is speaking?